Like the subject line says, I have been trying to get xdebug to work again on my Phpstorm setup. The only thing that changed was downloading and installing the new binary. I am on OSx runngin MAMP. With 2.0.0 and 2.0.1 everything worked. I tried several projects just to make sure, and none of them work. Is there anything else I can attach to get to the bottom of this. Please check that you set up the same value for Xdebug port in Project Settings -> PHP -> Debug. Probably some settings were reset to default after upgrade. Do you use 'Listen' debug button? Yes the xdebug port is set correct. I did check the break on first line, and the debug script does break on the first line of an index.php file, but anything furder than that doesn't work, any ideas? Looks like the problem with path mappings. Could you attach a screenshot of your server configuration(Project Settings->PHP->Servers)? Thanks so far, I am attaching the screenshot. Please don't forget that this used to work on the previous version. 2) Settings | PHP | Server -- please check if path mappings are correct (if you are using them -- they may have been reset), especially if symbolic links are in use. When index.php is hit, continue debugging line by line. If PhpStorm cannot find the file to debug it should tell you (AFAIK) and then you may need to check the path mappings (see above). Also, what kind of lines are you trying to setup breakpoints at -- are they simple statements like $a = 14; or $bbb = App::doSomethingUseful(); etc ... or something multi-line (array definition that occupies few lines etc) ? The project is based on the Symfony 1.4 platform. I uses the front controller pattern. 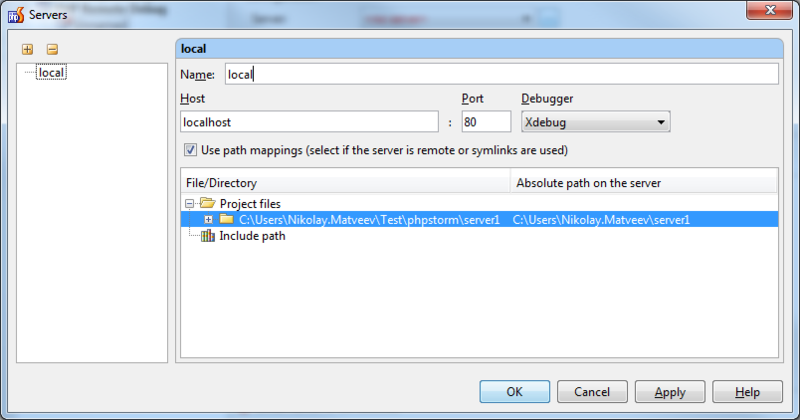 As far as I can recall I did not set any path mappings in previous versoin of Phpstorm. The structure of the project is very specific, so I don't know where to start setting up the paths for the plethora of classes and conventions used in the plattform. The debug breakpoint is on a proper line, I have been hit by that issue in the past, and I make sure of where the debug points are. 1) If you do not mind -- please try my suggestion from my previous post. 2) Please enable xdebug log (by configuring xdebug.remote_log in php.ini) & PhpStorm debugger log http://devnet.jetbrains.net/docs/DOC-1202 and attach results here -- it should give some info about which file xdebug tries to debug (in case if path mapping is actually required and is missing) and/or why that break point is not hit (but do not use breakpoints where they work & disable "break at first line" during this "experiment"). In any case -- Nikolay knows this area much better than me. When did you used debugger for this project last time (using 2.0.1 version)? Have you made any big changes since? (of course, you know much more about your own project than me, but maybe (just maybe) that breakpoint is not hit because that part of code is not actually executed -- for example, because of internal caching or something like that). I did try your suggestion to no avail. I am attaching both logs here. It seems from the xdebug logs that the breakpoints are picked up, but the ide is not respoding to them. My debugger worked for 2.0.1 version, and I haven't done anything tragic to code, I am setting the breakpoints on key locations that I know will be called throughout the application lifecycle. 2) Can you confirm me the project path (or paths if you have multiple protect roots) please. Yes this is correct, that is the first script that it is called. If you see the xdebug logs, it does have the breakpoints in the other files of the project. I re-attaching the logs, I missed the "g" in "debug". I also lost debugging after I upgraded. BUT I rebuilt the project and all is fine (why I didn't report it). A stupid question; but have you tried that? It looks like the pathing got mixed up somehow. A side note: I don't use MAMP. I use the 10.6 stock install. In case, that makes any differnece. You hit the spot with that one. Opening the project using "/Users/fotis/Development/workspace/pdt-ganymede-sr1/" solved the problem. But I am 99.999% sure that this worked in previous versions. Thank you for helping me with the matter. Opening the project using "/Users/fotis/Development/workspace/pdt-ganymede-sr1" solved the problem. But I am 99.999% sure that this worked in previous versions. There were no changes in this area since 2.0.1.